More than a million traffic accidents occur each year, many of which are trucking accidents. 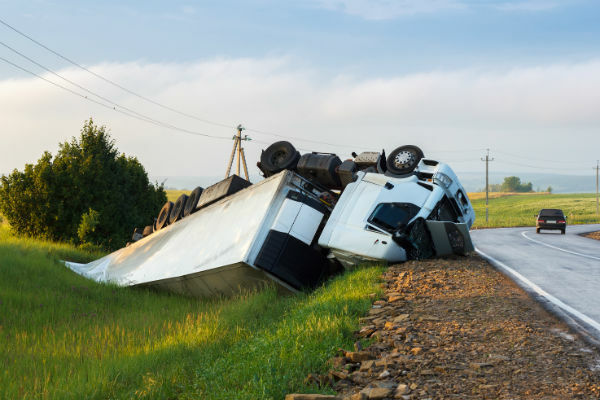 The experienced personal injury lawyers at Bolen Robinson & Ellis understand how traumatic a trucking accident can be, and our trucking accident lawyers are committed to ensuring that those injured in truck crashes obtain the results they deserve. Driver fatigue – Truckers often become fatigued by failing to abide by mandatory rest period between hours on the road, or by driving for a period of time that is longer than normal. Driver negligence – Negligent truckers pertains to aggressive driving, traveling at an excessive speed, improperly changing lanes, or keeping an inadequate amount of space between the semi-truck or trailer and the impacted vehicle. Driving in unsafe weather conditions or with poor visibility. Driving trucks that are too big or overloaded. Mechanical failure or failure to properly maintain the semi-truck or trailer. Rear-end collisions – This accident occurs when the truck or tractor-trailer crashes into an automobile traveling in front of it. Whiplash is a common injury in rear-impact collisions, even when the impact occurs at moderate speeds. Side-impact crashes or T-Bone accidents – A broadside crash occurs when the side of a vehicle is impacted by the truck or tractor-trailer. Sideswipes – This normally occurs when the sides of two parallel vehicles touch and “swipe” each other. Head-on crashes – These dangerous crashes occur when the front ends of two vehicles hit each other. Especially when a large truck is involved, this type of accident often results in fatalities. Hurt in a trucking accident? Contact our personal injury attorneys for a free consultation. Victims of trucking accidents often suffer the burden of large expenses, including hospital bills, medical treatment and medication, childcare, loss of personal time with loved ones, and missed time from work. A successful personal injury claim can reimburse victims for those expenses. Bolen Robinson & Ellis is committed to ensuring that trucking accident victims obtain the results that they deserve. If you or your loved one has been hurt in a trucking accident, please contact us to schedule a free consultation with one of our experienced personal injury attorneys. A few notable trucking accident results by our personal injury lawyers. $250,000 settlement against a transportation company on behalf of a legally disabled adult. $250,000 trucking accident recovery in Southern Illinois.